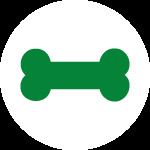 DOG-E-DOG is a dog walking, dog training, pet sitting and boarding service in Greenpoint and Williamsburg, Brooklyn. We're a small crew of experienced dog handlers, who live in the neighborhood and love working with animals. By night we are photographers, musicians, waitresses and delivery men, but by day you'll recognize us by our green bandannas, jangly keys, sick pics and our happy pack of dogs! Walking is an important and rewarding experience for our four-legged friends. On-leash exercise and the regular practice of walking etiquette will improve the quality of your dog’s overall health and curbside manners, while also relieving anxiety and tension. Your dog’s natural need for exercise, discipline and social engagement will be satisfied during our group walks—which means a more relaxed and happy, tail-wagging pooch to greet you at home! Private walks and field trips are available, too. Your pup will be treated to a fun outing with a small group of canine companions, and our professional handlers come prepared with plenty of supplies for all kinds of situations. Pet sitting for dogs, cats and other animals is a good option for pets that need or prefer to stay in their own home when the owners are away. This is a particularly great option for animals with social anxiety or behavioral issues as well as puppies and elderly dogs. The handler will stay in your home overnight with your pet and, as a courtesy, regular house-sitting duties are included with this service. We also provide home environments for our boarding dogs where they can stay overnight in comfort. It's not loud, overstimulating or boring either...It's a social, intimate and custom setting for your pup while you are away. 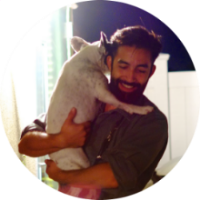 Eric (the founder + owner) is a certified dog trainer adamant about teaching a mixed approach, which means using a careful creative balance of reinforcement, redirection and a few lightly aversive techniques, if effective. Dogs, our relationships with them and their behavioral issues are complex and constantly changing. It's important for dog owners to be creative, consistent and headstrong when training. Eric is committed to improving your dogs behavior by teaching you how to shape it. Eric founded DOG-E-DOG in 2010 with the mission to enhance the quality of your dog's life with leadership, exercise and affection. Since 2012, the company has grown into a small team of dog lovers and Eric has become a certified trainer. Steady growth continues, one step at a time.